Can you remember the first chicken wing you had? I don't mean a fried chicken wing left over because it was the last piece from a Sunday fried chicken dinner or a bucket from KFC. I am talking about a real wing. A chicken wing cooked for the purpose of being a wing, not an "also ran". Like buffalo wings or hot wings. My first ones were at Stadium Club where my friend Carson worked as a cook. It is the Third Annual Week of Wings over at Hot Sauce Daily, a celebration of wings. 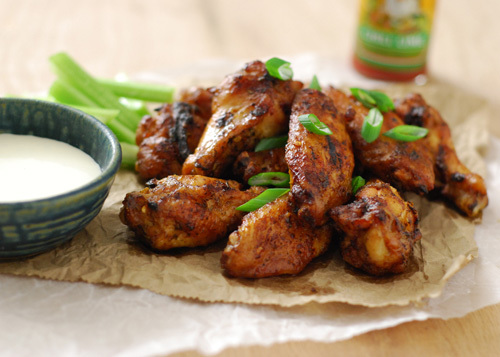 Brian and Marilyn will be grilling up wings, reviewing wing sauces, and checking out all things wing related. Hop over there and check their wing-centricity all week. Here is my tribute to Week of Wings. Traditional "buffalo sauces" have hot sauce, butter, spices and an acid, such as vinegar and/or Worcestershire sauce. For this one, I relied on the lime juice in the Cholula Chili Lime sauce as the acid. Preheat a charcoal grill to 350-375f set up for indirect heat*. Season the 24 wing pieces with the dry rub (reserve 1/2 tsp of the rub for the sauce). Roast the wings on a covered grill for 30 minutes. Flip the wing pieces and roast for 20 minutes. Meanwhile, melt 1 Tbsp butter over medium heat in a saute pan and saute the garlic for 2-3 minutes. Add the remaining butter and dry rub, whisking continuously until well blended (another 2-3 minutes). Once the wings have roasted a total of 50 minutes, remove them to a large bowl, pour the sauce over them, and toss to coat thoroughly. Roast the wings another 7-10 minutes, or until the sauce bakes on and the wings reach an internal temp of at least 170f. I used Cholula Chile Lime Hot Sauce. You can use your oven for this instead....if you insist. 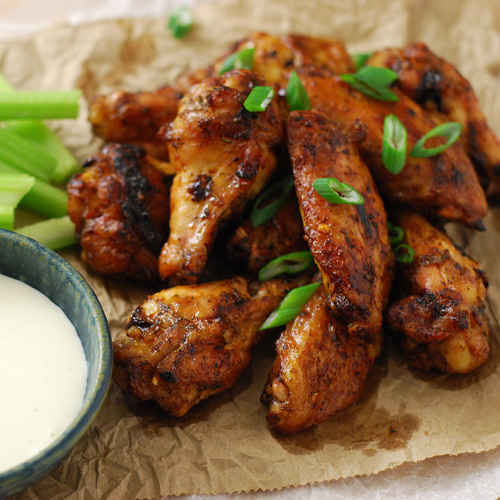 Just remember, it doesn't taste as good and every time you use an oven instead of a grill, an angel loses it's wings. Mmmmmmm fire roasted angel wings, heavenly! [Standard Disclaimer] I received no compensation from Hot Sauce Daily for this post but Brian did threaten to boil ribs if I didn't post something wing related this week.